David Blake and Park Lane. Photos ©ManciniPhotos. Mill Spring, NC – May 16, 2016 – David Blake of Wellington, FL finished a winning week at Tryon International Equestrian Center (TIEC), capturing two major stake classes during Tryon Spring 4, taking the $10,000 Suncast® 1.40m Welcome Stake aboard Bella Donna and the $25,000 Tryon Resort Grand Prix with Park Lane. Blake crossed through the timers in 44.15 seconds aboard Park Lane to steal the win from Cesar Almeida and Chaco 34, who finished the short course in 45.556 seconds. Carlos Ramirez and Happy Wandor Van T Roosakker earned third place, with a time of 51.452 seconds. Competition at TIEC continues this week with the start of Tryon Spring 5 on Wednesday, May 18, which continues through Sunday, May 22. Blake and Park Lane, a 2005 Scottish Sport Horse gelding (Pall Mall x Nistrea) owned by Pine Hollow Farm, have steadily risen through the ranks at TIEC, and have become a competitive pair in many of the larger classes offered at the venue. Park Lane, who is part of the strong cast of Blake’s growing string, also finished in third place in the $10,000 Suncast® 1.40m Welcome Stake, behind barn mate Bella Donna, who took first. The course was designed by Hector Loyola (PRI) and welcomed 23 entries who tested the first round, while six pairs moved to the jump-off round. Amanda Flint found herself narrowly edged from the jump-off after accumulating the only single time fault round aboard VDL Wittinger. “Hector [Loyola] said that the time was going to be neat and it was, but also very quick, just not too tight. I had a fair plan as to what I wanted to do with all three of them. My first ride, Bella Donna, who won the Welcome, had one down, so I knew how I wanted to approach the course for my next two rides,” he continued. Blake piloted both Park Lane and Casinjo Ex Z to the jump-off round and noted that both horses gained valuable experience under the lights in the class. Casinjo Ex Z, a newer mount for Blake, finished the evening with a rail in the jump-off, which placed them fifth. The Pine Hollow Farm team took advantage of their time at TIEC last summer, as Blake amassed some of his biggest career victories in 2015 aboard his top mount Binkie. With a talented string also moving into the top levels of the sport, Blake felt pleased with the performance of his three mounts, and is looking forward to a strong spring and summer campaign. “He’s a real trier and gives you everything every time you take him out. He just has so much heart. That’s an important quality to have in a horse when they want to win as much as you do,” he continued. Blake and Bella Donna, owned by Pine Hollow Farm, powered to the top of the leaderboard in the $10,000 Suncast® 1.40m Welcome Stake at TIEC on Thursday, May 12, finishing with a time of 42.28 seconds. Bryn Sadler of Santa Fe, NM and Cezarro crossed through the timers in 42.584 seconds for second place, while Blake secured third with a solid performance from Park Lane with a time of 43.573 seconds. Pleased with his ride aboard Bella Donna in the $10,000 Suncast® 1.40m Welcome Stake, Blake felt the 2005 Warmblood mare displayed her true potential and outperformed his expectations, as it was their largest class together to date and she tackled the track with ease. “We got her just before the Winter Equestrian Festival (WEF) and just worked with her during the winter circuit on her rideability in the ring. We kept her in the 1.35m classes and this was her first large class with us and she really rose to the occasion,” said Blake. “She’s a bit smaller for me, but she’s a very correct jumper and has a great technique. She’s overall just a very competitive horse and is really useful for these types of classes and it was great experience for her,” he continued. While Bella Donna seems to be peaking at the right time for Blake, he and his team continue to be meticulous with timing, making sure that each horse is performing to the best of their ability while also balancing time off. “I really try to focus on building them up and doing a few big classes and then they each will get a few weeks off. I’ll show a few in the national classes next week as well, but it’s very nice to have a couple ready and peaking for each class. It makes for an exciting season,” commented Blake. 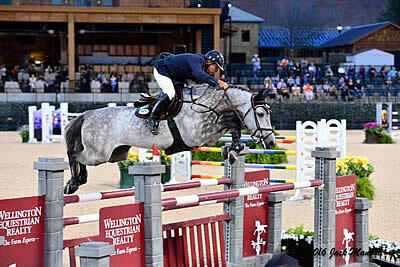 “We really enjoy it here in Tryon and they all always seem to jump well. We’re going to have more horses at the top levels this year and hopefully we’ll be back to where we finished last season with some strong placings in the FEI classes throughout the season,” he noted. Francesca Damasceno of Palm Beach Gardens, FL and her own Watermill Time secured a win in the 1.15m Open Jumper presented by Beval Saddlery, besting the class with a time of 58.228 seconds. Bryn Saddler of Santa Fe, NM and Cinderella, owned by Showcase 81, LLC, took second with a time of 64.001, while Sara Green piloted Chanel, owned by Sloan Hodges, to third place. The Adequan® Open Jumper 1.30m division saw Cesar Almeida finish with champion honors aboard San Quinta SN, owned by Macro Antonio Alencar. Amanda Flint of Long Valley, NJ and Daisy Chain VT, owned by J&J Imperatore, LLC, finished with reserve champion honors. Miguel A. Ventura of Murfreesboro, TN and Coulance, owned by Kenya Greenburg, took champion honors in the Nutrena Open Jumper 1.40m division at TIEC, while Ilan Bluman of Wellington, FL and Hector by Picobello, owned by Daniel Bluman, earned reserve honors for the division. Laura Lindner of Warren, NJ and Carrara 11, owned by Helen Krieble, finished as champions in the Tryon Estates Junior/Amateur Owner Jumper 1.20m division, while Rebecca Bergman of Durham, NC and her own Dyon earned reserve champion. John Barker of Middleburg, VA and Carlotta, owned by Ashley Hodges, were victorious in the USHJA National Hunter Derby at TIEC this past weekend, capturing the win with an overall score of 176. Sara Green and Carabello collected second place honors with a 170, while Donald Sheehan of Maryville, TN and Kenan, owned by EHM Equestrian LLC, finished in third. Barker and Carlotta, a 2008 Warmblood mare, led from start to finish, earning an 88 in the first round, and putting another strong trip in the second round to repeat the score of 88. Green and Carabello finished with an 89 in the handy round, the highest score of the afternoon. Isabel Stettinius of Washington, D.C. and Balenciaga, owned by Doreen Toben, collected top honors in the $1,000 Junior Hunter Classic, with a score of 166. Elizabeth McKim of Knoxville, TN and Quintessential, owned by EHM Equestrian LLC, finished in second place with a final score of 160. Caitlin Heilferty of Waxhaw, NC and Skyfall, owned by Caron Stucky, took third, with a score of 147. In the $500 NAL/WIHS Children’s Hunter Classic, Janie Ware of Middleburg, VA and Welcome, owned by Mary Elizabeth Cordia, topped the class with a score of 152, while also taking second place aboard her own Trump Card, receiving a 150. Jennifer Cahill of Charlotte, NC and Incognito, owned by Donna Marie Deyoung, finished in third place with a two trip score of 149. Elizabeth McKim of Knoxville, TN and Casper van’t Gestelhof, owned by Patricia Garrett, found themselves atop the leaderboard in the ASPCA Maclay, while Lauren Lindner of Warren, NJ and Diomaro VDL, owned by Amanda Flint, finished in second place. Curry Sherard of Spartanburg, SC and Eloubet P, owned by Christi Israel, rounded out the top three placings. The THIS Children’s Medal saw Grace Roberts of Knoxville, TN and Olivier de Upatoi, owned by Kathleen Harrigan, take the win, while Carson Odle of Fort Mills, SC and Cortina’s Allesandro, owned by Brian Stucky, took home second place. Catherine Sharp of Tryon, NC and her own Imperio, rounded out the top three finishers. Please visit www.tryon.com or call (828) 863-1000 for more information.